William S. Rice, painter, printmaker, and craftsman, was born in Manheim, Pennsylvania. 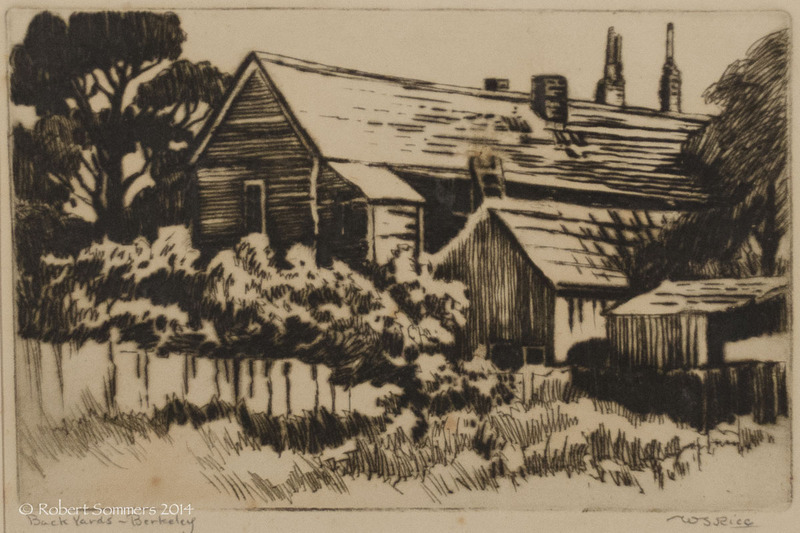 After completing studies at the Pennsylvania School of Industrial Art and the Drexel Institute in Philadelphia, a job offer brought him to California in 1900. At the age of twenty-seven, he accepted the position as Supervisor of Art in the Stockton Public Schools; a position he held until 1910. That same year, he moved to the Bay Area where, for the next thirty years, Rice taught in Alameda and Oakland, as well as at the University of California Extension and the California College of Arts and Crafts where he earned his BFA in 1929. During the 1915 Panama Pacific Exhibition, Rice had a chance to study and absorb the techniques of the Japanese woodcuts which he was to incorporate into his own working knowledge of the medium. In 1918, the first major exhibition of his color woodcuts hung at the California Palace of the Legion of Honor. Though he gained national recognition for his printmaking, Rice embodied the Craftsman spirit, painting with watercolor and oil, and working in ceramics, hammered copper, and woodworking. He authored three books on the subject of block printing, including Block Prints and How to Make Them, and wrote articles on naturalist subjects for Sunset magazine. Rice was a member of the California Society of Printmakers, California Society of Etchers, Prairie Printmakers, Bay Region Art Association, North West Printmakers, and the San Francisco Art Association. Rice’s work is represented in numerous private and public collections, including the Achenbach Foundation for the Graphic Arts, Boston Public Library, Elvehjem Museum, Fitzwilliam Museum, Library of Congress, National Museum of American Art, Oakland Museum, and the Worcester Art Museum.